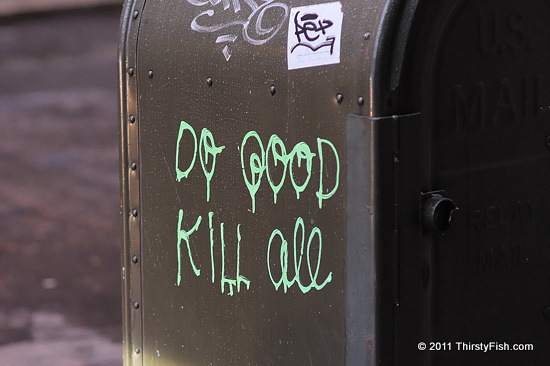 This message was painted on a Postal Service box in DUMBO last year. It has since been painted over, but you can still make it out under the new paint. Franz Kafka once famously stated: "There is hope, but not for us". In fact, the word Kafkaesque is derived to mean, "Marked by a senseless, disorienting, often menacing complexity. Marked by surreal distortion and often a sense of impending danger". This sign takes Kafkaesque a little further. Of Earth's 4.5 billion year history, life has existed for almost 4 billion years. During this time, many guests have come and gone; From primitive lifeforms to dinosaurs. The same is bound to happen to humans. And the odds are, we will probably bring our own extinction before a natural catastrophe, such as the asteroid impact that is believed to have wiped out the dinosaurs. Life will continue even after humans are long gone. What we now understand to be "good" or "bad" is pretty much irrelevant in the context of life on earth. The real question is, will our consciousness survive? Will we be able to find a way to forward the knowledge that we have accumulated to the next generation of creatures that will dominate the earth, or, will they end up being primitive forms starting from scratch. "Good" and "bad" have to be redefined in this context. And the only true measure of our intelligence is how long we can exist as "intelligent beings". Of course, others might argue that we have yet to find intelligent life here on earth.